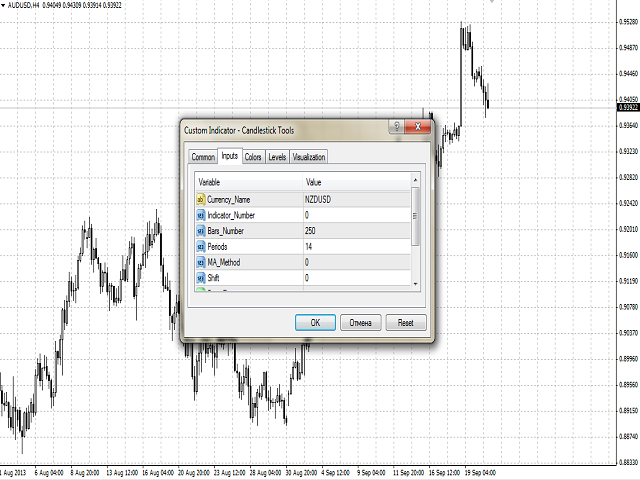 Candlestick Tools is a colored multicurrency/multy-symbol indicator. It shows one of four standard indicators as a candlestick chart in a separate window below the chart of the main financial symbol. The default indicator is Commodity Channel Index. You can set the number of displayed candlesticks, as well as select bullish and bearish coloring. The indicator can be used as a visual tool that represents market data in a convenient informative way, which helps to analyze market events. The indicator values based on Open prices - buffer 0. 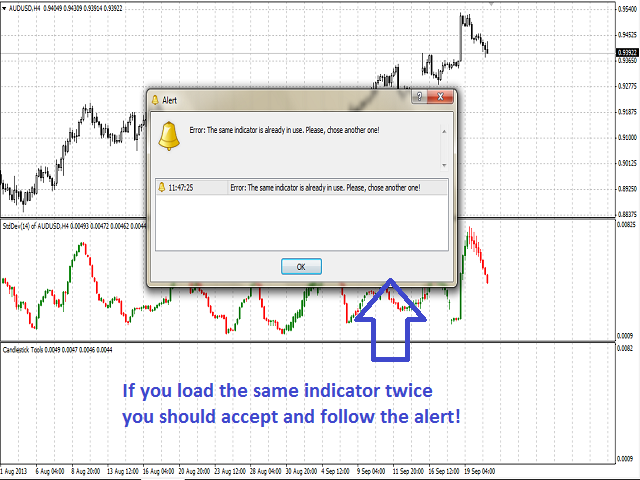 The indicator values based on High prices - buffer 1. The indicator values based on Low prices - buffer 2. 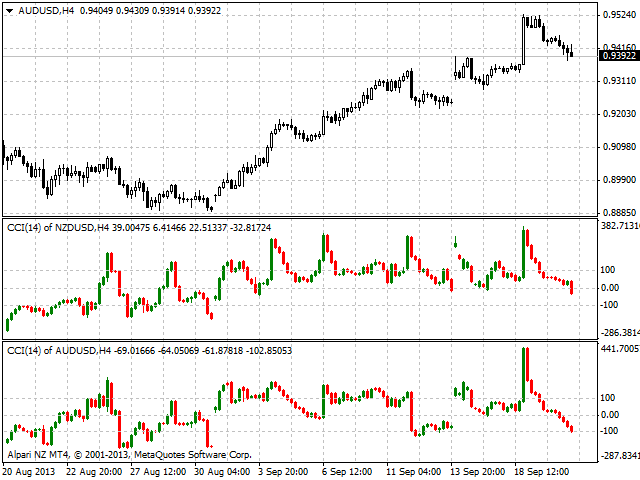 The indicator values based on Close prices - buffer 3. Indicator_Number - th number of the indicator. Bars_Number - the number of bars to be displayed in a separate window. 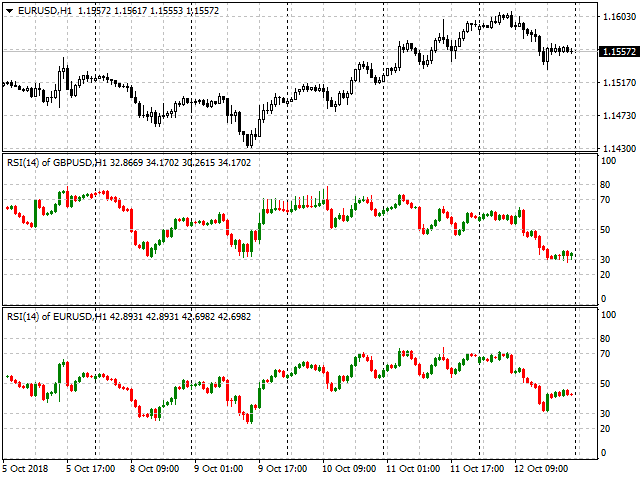 MA_Method - averaging method for the MA of the basic indicator. Shift - the sift of the basic and calculation indicator relative to the price chart. true - according to Bars_Number. false - maximum available bars in the history. Bulls_Color - the color of the bullish candlestick. Bears_Color - the color of the bearish candlestick. A chart with the same parameters on the same financial symbol cannot be displayed more than once. Otherwise, you receive an error message related to its re-use and will be offered to select another financial instrument. 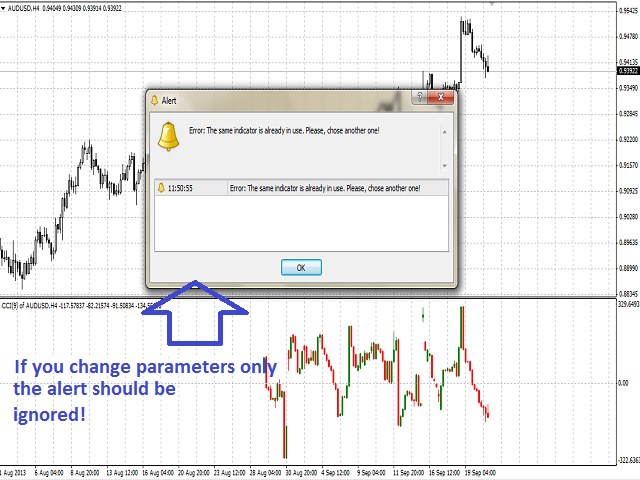 However the message should be ignored when you only modify parameters of a drawn indicator for calculation (see screenshots). It is recommended to use the indicator with the parameter Bars_Number not exceeding the number of bars that can be shown in one window (about 250 bars). In case of loss of connection with the trading server, when connection is restored and data is downloaded, the chart will be redrawn from the beginning to the number of bars specified by Bars_Number and Bars_Flag. Force and StdDev are exluded.